LEXINGTON, Ky. (Jan. 21, 2010) – David McNear, an assistant professor in the University of Kentucky College of Agriculture, and Bruce Hinds, an associate professor in the UK College of Engineering, received Presidential Early Career Awards for Scientists and Engineers during a recent ceremony at the White House with President Barack Obama. The award is given to scientists who are within five years of receiving their doctorates and demonstrate great potential for leadership in their field of study. Nine federal departments and agencies join together annually to nominate the most meritorious young scientists and engineers. McNear was nominated by the U.S. Department of Agriculture and Hinds was nominated by the National Institutes of Health, Department of Health and Human Services. Hinds said at the White House ceremony, President Obama was greeted with raucous applause from the award winners. [IMAGE1]"Up close, we could really sense his enthusiasm for the topics of science and engineering advancing our country," Hinds said. "He gave us a great five minute pep talk giving us our marching orders to go achieve important technical advancements and further math, science and engineering education." 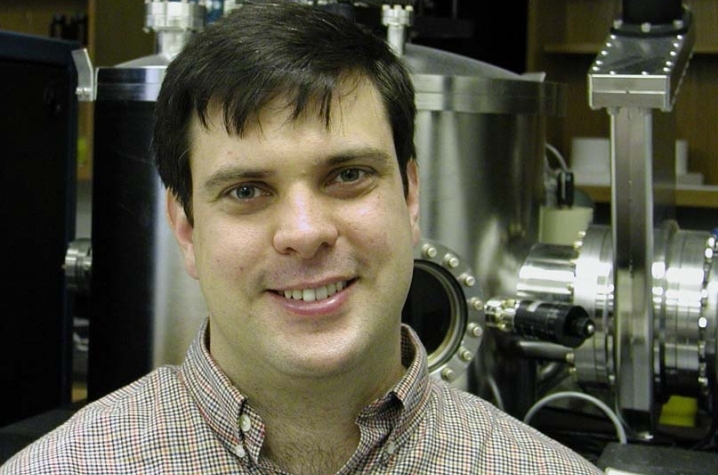 Hinds, who is also UK's William Bryan Professor in Chemical and Materials Engineering in the College of Engineering, performs research on nanoscale device fabrication. Previously, Science and Nature magazines featured reports on Hinds' research that discovered a way to make carbon nanotube membranes that permitted fluids to flow through at a rate 10,000 times faster than normal materials. This system is being used to pump drugs, using very small voltages, in a programmable skin patch device for drug addiction prevention and treatment. [IMAGE2]McNear was nominated for the award by Nancy Cavallaro, manager of the soil processes program with the USDA’s National Research Initiative. She recognized his abilities from a grant proposal he wrote to study a fungal endophyte that lives in the shoots of tall fescue. McNear’s proposal sought to explain how the endophyte affects compounds released from the plant and into the rhizosphere, the area where the soil, water and plant roots meet and interact, and how these compounds influence soil microbial populations and ultimately carbon and nitrogen cycling in agricultural fields throughout the Southeast. He received funding for the grant and is in his first year of study with co-investigators Rebecca McCulley, UK grassland agroecologist, and Noah Fierer, a microbiologist at the University of Colorado at Boulder. In addition to his work with tall fescue and its endophyte, McNear and his lab members study the rhizosphere processes and plant genetic mechanisms involved in plant tolerance to heavy metals and their ability to uptake them from soils. This research is done in an effort to better use plants to remedy soils containing too many metals or to fortify staple food crops with essential micronutrients. Researchers in McNear’s lab also study how plant processes can be altered to increase the allocation and sequestration of carbon in soils. He also teaches two classes. McNear credits UK and good collaborators with allowing him to pursue his varied interests.